One sign that you’ve built a successful pond is the presence of wildlife which is attracted to it. One animal in particular that many people want to attract are pond frogs. These amphibians begin their lives in an aquatic environment, and even as adults they’re never too far away from water. Below are some tips for attracting them to your pond. Whether man-made or natural, ponds are attractive to male frogs in particular as they will hibernate there during the winter months, lying dormant beneath the water. However, they still require oxygen to live, which is why you will want to monitor the pond when it freezes and thaw a portion of it by putting a hot pan of water on top. Frogs also like ponds which have lots of shade as it makes the area attractive for breeding. The edges of your pond should be shallow as this makes it easy for the frogs to get in or out of the water. Some of the edges should taper off towards vegetation which is moist, such as leaves or mulch. This will provide the frogs will shelter, hibernation and food. Frogs need shade to protect them from the sun, but too much shade will harm the pond as it needs some sunlight. Therefore a portion of the pond should have constant exposure to sunlight while other parts should be in shade at all times. One natural way to provide shade is through aquatic plants such as marsh marigolds or water violets. These plants grow well in ponds, and frogs are most attracted to bodies of water which have depth of two to three feet. 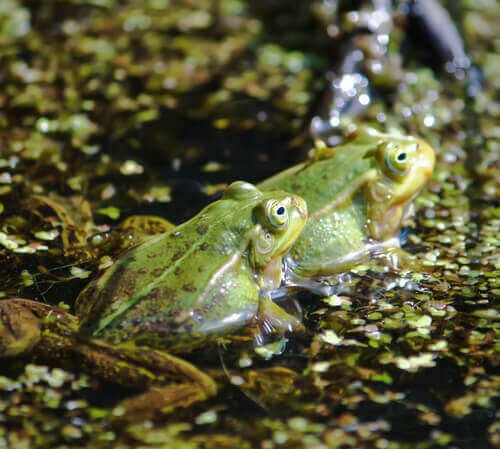 Frogs play an important ecological role in the ponds where they reside. They prey on insects, and this is important as it keeps the insects from increasing in number to the point where they become destructive. Frogs also consume mosquitoes, flies, snails, beetles and even cockroaches, as well as various plants and shrubs. Frogs also love compost heaps and adding this to your pond is one of the best ways to attract them. Frogs enjoy any place that is moist and humid with lots of insects to dine on. Creating the right pond environment will attract frogs, but it may take two years for them to appear. Many pond owners become impatient and decide to drive down to their local pet store where they buy a frog and then introduce it to their ponds manually. This is a bad idea. Frogs that are introduced in this manner may either die or simply leave. It is also important to remember that frogs are fragile creatures. If you use nylon mesh in your garden it must be taut and no more than 1.5 inches otherwise it can trap and kill them. If you have cats, dogs or other pets, they should be kept away from the pond otherwise they could also kill the frogs.